As a longtime follower of everything shale gas related I was quite pleased to hear our president come out in support of shale gas development last night, and the reasons are clear. Natural gas production from the Marcellus, Utica, Barnett, Eagle Ford, Woodford, Fayetteville shale plays, and others have drastically impacted us all. The graph below makes it obvious that without shale gas development coming along at a time when we were facing steep declines in natural gas production from other more"conventional" sources, we would all be paying more for energy. 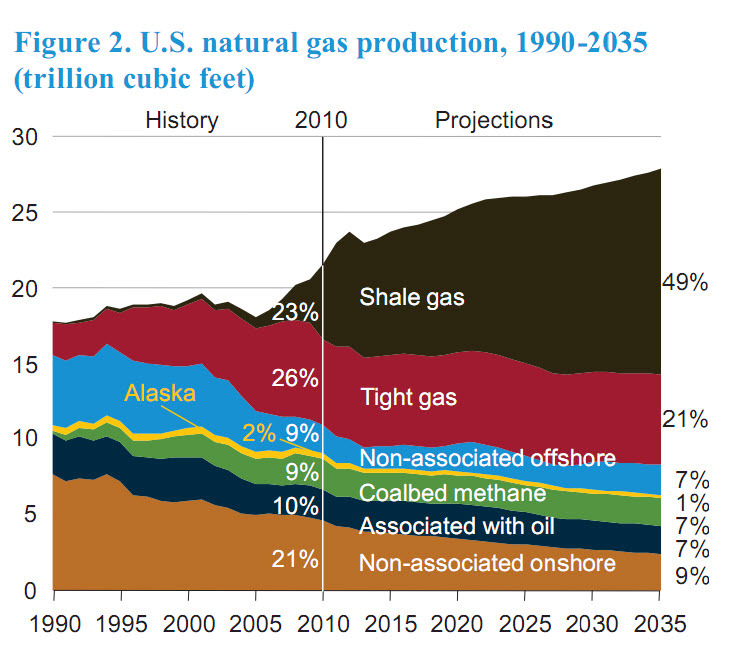 Shale gas development kicked in at a very good time indeed. President Obama also sited that "Experts believe shale resource development will support more than 600,000 jobs by the end of the decade." In a time of high unemployment and threats of higher energy prices and tighter supplies, shale gas development, along with shale oil development, could simply not be ignored. And acknowledging the controversy over fracking and environmental concerns the president had this to say, "America will develop this resource without putting the health and safety of our citizens at risk." So there we have. We absolutely must find ways to reduce risk and development this "shale resource gift" safely. I believe that it can be done, and that it will be done. There will always be some risk, but just like there is some element of risk in all that we do, from driving down the highway, to boarding an airplane, or piloting an oil tanker, this is a risk that we will mitigate and accept. "The development of natural gas will create jobs and power trucks and factories that are cleaner and cheaper, proving that we don’t have to choose between our environment and our economy. And, by the way, it was public research dollars over the course of 30 years that helped develop the technology to extract all of this gas out of shale rock, reminding us that government support is critical in helping business in getting new ideas off the ground." Until recently, Ohio resident's only contact with company's like Exxon Mobil have been at the gas station. Now, as a result of the potential to extract huge quantities of oil and gas under our feet, large oil and gas company representatives are far more visible, finding their way into town hall meetings, industry forums, government buildings, and construction sites from which oilfield equipment will be staged. Along with large oil and gas company visibility, Ohio communities and energy groups are also receiving far more attention than they once did now that the potential for jobs and land lease and royalty checks are in the offering. Everyone wants to know the facts and understand the issues. Environmental groups are also making themselves known, voicing their concerns that oil and gas companies will not protect our fragile ecosystems and water supply. Recent Youngstown earthquakes fuel speculation that the industry brings with it some unwelcome baggage. The Alliance Website has not yet appeared, but is expected to popup soon. The January 16, 2012 town hall meeting in Bridgeport, organized by the alliance, is the latest example of community outreach. As the energy industry continues it's decent on Ohio, it will be more and more important to separate fact from fiction. The potential direct energy jobs, ancillary economic activity from hotels to restaurants, and landowner $$, in an economy such that it is, creates enormous interest and strong feelings. As long as the Utica Shale can be exploited in a relatively safe and environmentally conservative manner, Ohio, and a nation less dependent on foreign oil and gas, will be extremely thankful and fortunate.